today in the afternoon i met the myopic gran in markdorf while i was strolling about the streets. she is known all over in town. 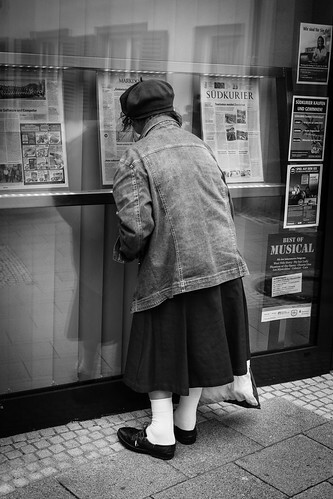 most of her time she sits at the bakery's and tries to read the newspaper which is displayed there. because of her malfunctioning eyes it seems to last hours till she has coped with reading the press. it was the first time that i've seen her in the street, of course when she was reading again. unfortunately she is in a bad condition: she is myopic, a bad walker and realises almost nothing and nobody around her. maybe all of her senses go down bit by bit. but despite the physical decay she is really cuddly: funny to see how she pressed her nose against the window... and satisfying to assess how she masters her life after all.